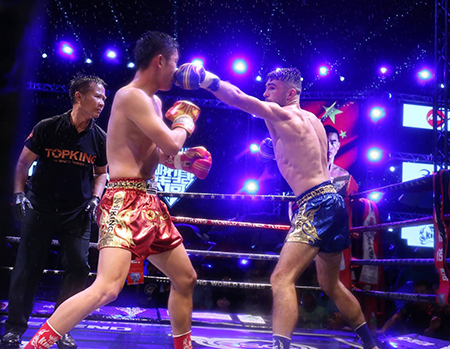 Two Singpatong stars Rafi Bohic and Wuttichai won their fights in Bangkok and Nothern Thailand. Rafi Bohic faced a Chinese fighter Han Zi Hao in 176 lbs. weight class. Topking World Series held its 21st event from Surat Thani, Thailand. The show aired live at 7:30 a.m. ET on Thai TV channel MONO 29. In the main event, former Lumpinee stadium champion Yodwicha from Kemmuaythai gym looked to keep his winning streak alive against France’s Georges Salomon. Yodwicha defeated Georges by TKO Round 1 with his right elbow. Rafi gallantly traded punches with Han Zi Hao. Rafi pulled away in the second round when he scored on a devastating high knee. In the last round, Rafi declared a winner by points against Han. Here is Rafi’s full fight below. Meanwhile, in Lumpinee Stadium, Bangkok, Thailand, on Saturday, Wuttichai showed off an aggressive Nerphet Sitlomnow in the fourth round of their bout with a front kick right to the jaw. Singpatong fighter Wuttichai Kietjamroonrit won on points against Nerphet Sitlomnow in Muay Thai Kiatpetch Super fight. The perfectly timed strike left Nerphet completely out cold. Here is Wuttichai’s full fight below.